Anyone who has ever tried to handle a legal matter on his own has probably made the acquaintance of a court clerk. These clerks are responsible for the administrative work involved in running municipal, county, state and federal court systems. Whether you want to file a legal complaint or just pay a fine, you'll most likely turn your paperwork or money over to a clerk. The responsibilities of this position can vary greatly depending on the courts served, the clerk's level of experience, and the region in which he or she works. You may begin in an entry level position and work your way up from there. With education and experience, court clerks can advance to higher positions of responsibility. Deputy clerk: Most court clerks begin as deputy clerks, also known as assistant court clerks. They perform a variety of administrative duties, including preparing and processing legal documents, correspondence, motions and orders, and providing customer service to the public, judicial officers, attorneys, and staff. Court clerk: Deputy clerks can advance to the position of court clerks. Court clerk responsibilities are similar to those of deputy clerks, but they involve higher levels of responsibility and compensation. Chief court clerk: Chief court clerks, also known as chief deputy clerks or chief clerks, are the highest level in the court clerk system. In some jurisdictions, the chief court clerk is an executive level position. Chief court clerks are responsible for all administrative and operational elements of the Clerk’s Office. They often supervise other staff. This is effectively a management position. At a minimum, court clerks possess a high school diploma or its equivalent. Experience counts for a lot on the upward-mobility ladder, but you may be able to at least get your foot in the door with no further education beyond high school. Some court systems require at least two years of college, and many jurisdictions prefer a bachelor's degree. A background in business or public administration, political science, criminal justice, law or a related field is helpful. Salaries for court clerks vary according to jurisdiction, court, and position. Clerks working for the federal court system generally earn the highest salaries. Clerks who are just starting out with only a high school degree tend to earn the least. The median salary as of February 2019 was approximately $39,499, which means just as many clerks earn more than this as those who earn less. 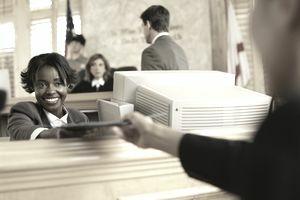 Court clerks generally work in an office setting and may be required to sit or stand for long periods of time as they perform filing, copying, and administrative work. Clerks often must bend or stoop to retrieve files and lift boxes, files and other materials weighing up to 30 pounds or more. Court clerks usually work a five-day, 40-hour week. Their hours may vary according to federal or state laws, jurisdictional rules and the orders of judges or others with the power to regulate hours of work. Most holidays are paid days off. Clerks cannot dispense legal advice, although they're often asked to do so. This can be frustrating for the citizens they serve because they can explain how to file a document, but they can't detail the legal ramifications of doing so. This can be a fine line that is difficult to maintain. An entry-level clerk typically has much more contact with the public than a chief court clerk, who rarely or ever has reason to interact with the average litigant. The customer service aspect of this job can be particularly trying for those without experience in dealing with the worst human nature has to offer. People don't go to courthouses because everything is great in their lives — they have problems, they want answers, and they may become angry and even abusive when they're told that only a lawyer can give them those answers. A thick skin is required. Court Clerks may belong to professional associations, such as the Federal Court Clerks Association or the National Association for Court Management.